You don’t need to look far to find an adopted shelter pet. Reality stars to bona fide rock stars (and everyone in between) are adopting shelter pets — and bragging about it! Ask almost anyone what type of cat they have, and quite often the answer is “a rescue cat.” Maybe it’s the increased awareness about puppy mills, or an elevation in the status of adoptable animals, but it’s undeniable that the country is boasting more no-kill communities than ever before. Adoption is the cornerstone to saving more animal’s lives. Let’s celebrate National Adopt a Shelter Pet Day with some celebripets who got their starts in shelters! 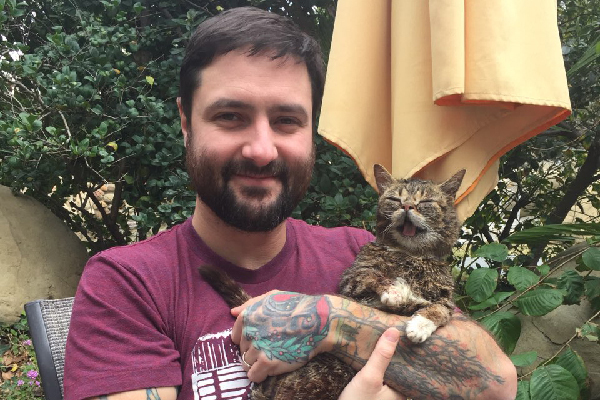 Lil BUB and her human, Mike. Photography courtesy Annie Butler Shirreffs. Lil BUB is that impossibly cute cat who looks like a kitten. Born with an extreme form of dwarfism, she’s a tiny girl. She also has further birth defects that rendered her toothless, along with sporting a malformed lower jaw. The unusual kitty was born to community cats in a shed and taken in by Mike Bridavsky at a few months old. Mike decided to adopt her with the belief that she would not live long, but he would give her the best life for as long as he could. That was seven years ago. Since then, Lil BUB has racked up millions of views on every social media platform. Although she wasn’t exactly rescued from a shelter, Lil BUB has raised over $300,000 for homeless pets with special needs through the ASPCA’s Lil BUB’s Big Fund. One of the greatest proponents of rescued pets has been the internet. And one of the Internet’s most elusively interesting stars is a rescued tuxedo cat named Henri. Henri, le Chat Noir, was adopted from the Seattle Animal Shelter in Washington state. Luckily, he was adopted by an aspiring film student who found the tuxie to be an inspiring muse. The handsome cat’s rich interior world is expressed in French (with subtitles) and his YouTube channel is one of the platform’s most popular. Ennui finally has the perfect vehicle in one special adopted cat. Nala Cat — a.k.a. the kitty who made crocheted shark hoodies cool — was also adopted from a shelter. When Varisiri Methachittiphan went to an animal shelter to meet some pets, she had no intention of adopting a shelter cat … until she saw Nala, a tabby/Siamese mix. According to an interview with Methachittiphan in Mediakix, Nala is accidentally famous: “I didn’t think that she would be so famous because she looks so normal … At the time Instagram had just started, so my sister said that I should start an account for Nala so that I could share her photo with everyone because she looks so cute with her big blue eyes.” Now with millions of admirers, Nala is using her fame to give back to an array of local shelters. Hooray! Monty is a former shelter cat. Photography by Michael Nielsen. 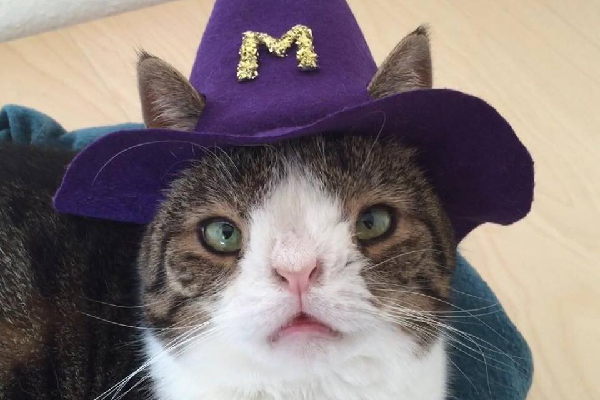 Monty is another cat with millions of video views and thousands of followers. Monty was adopted in 2013 by a couple in Copenhagen, Denmark from an animal shelter. Born with birth defects that affected the structure of his face, the white and tabby kitty is a testament to the resilience of shelter pets! His pet parents marvel at how wonderful it is to live with the amazing cat. Their Facebook page says it best, “We wish for Monty to be an ambassador for special-needs animals that may not look perfect in everyone’s eyes! 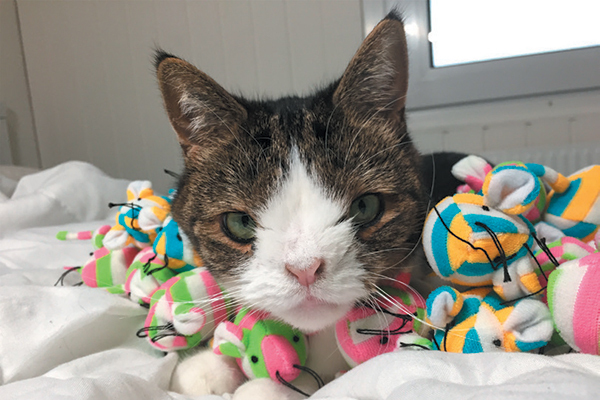 We also want to raise attention to the fact that looking different doesn’t mean you can’t be fantastic.” Monty’s mission goes even further — one of his most-viewed videos is the Ten Reasons Why You Should Adopt A Shelter Pet. He’s truly an ambassador for National Adopt a Shelter Pet Day — borders be damned! Every Dog Has His Day on the Great White Way! Bill Berloni. Photography by Denise LeBeau. While this article is for Catster, one of the best advocates for National Adopt a Shelter Pet Day is right on Broadway. 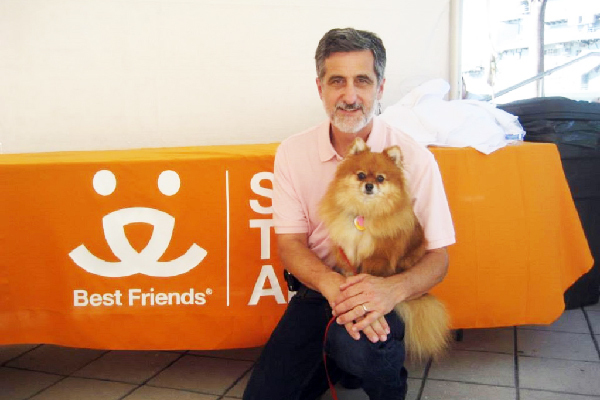 Bill Berloni, founder of Theatrical Animals, has an exclusively all-rescue pup repertory company. Sandy is a shaggy terrier mix who was rescued from death row in a Connecticut shelter and went on to star in the musical Annie. And Trixie is a purebred Pomeranian who was rescued from a hoarder and wound up in a Westchester, NY, shelter, where the future stage-and-screen star of Anything Goes was adopted by Berloni. “I’ve trained more than 400 dogs over the years, all from shelters,” says Bill. “When people ask me where I got Trixie, I tell them they could have adopted her the day before I did. Shelters are full of beautiful and sweet dogs.” For folks who think shelter pets are “damaged goods,” it’s time to update your beliefs. One of the best ways to support National Adopt a Shelter Pet Day is to adopt a cat from a shelter! But how do you know if you’re ready to adopt a cat? Check out our cat adoption checklist and then click over to read our checklist for bringing home a new cat. Don’t have the means to adopt a shelter cat at the moment? Here are a few other ways to help shelter cats.